Make a list of grep patterns, assign a style combination to each. Is there a better alternative to StylePainter for InDesign? Is StylePainter for InDesign really the best app in Author Tools category? Will StylePainter for InDesign work good on macOS 10.13.4? Lightning Brain StylePainter for InDesign... Make a list of grep patterns, and assign a style combination to each of them. 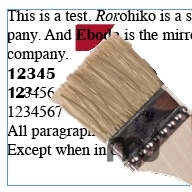 Then execute 'Paint Document' to search for matches - each match is 'painted' in the appropriate style in a single operation. StylePainter for InDesign needs a review. Be the first to review this app and get the discussion started! StylePainter for InDesign needs a rating. Be the first to rate this app and get the discussion started!